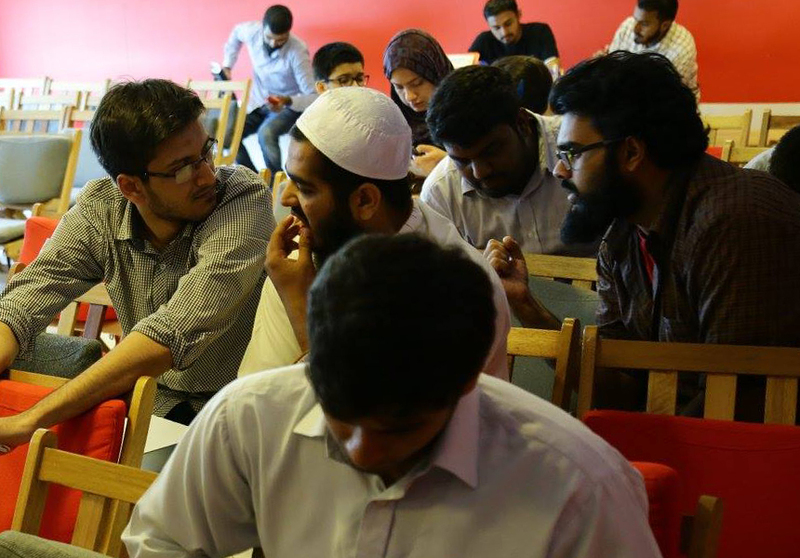 The folks at The Nest I/O hackerspace in Karachi, Pakistan had a rather large meetup for World Create Day featuring the finest in laser cut, googly-eyed fighting robots. [Nasir Aziz] hosted a meetup at his favorite hackerspace for people to get together, discuss, and build something for the Hackaday Prize. The highlight of the meetup was a discussion from EjaadTech, an industrial design firm that graduated from The Nest I/O accelerator. Among the projects invented during World Create Day were a ‘shopping helper drone’ and miniature fighting robots. Useful projects on one hand, awesome projects on the other, just like we like it. MakerBay is a hackerspace located smack in the middle of Hong Kong. Like most hackerspaces, finding a place was a problem, but the folks at MakerBay found something spectacular. They’re zoned industrial, and only a five-minute walk from a train station. 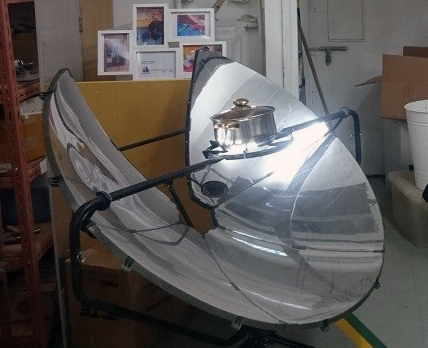 There are quite a few projects sitting around MakerBay including a solar oven that would be pretty dangerous if it were outdoors on a sunny day. Also on deck are prototypes of small sailing vessels with a flexible hull designed to track and contain oil spills. Highlights of World Create Day include upcycled wood construction and a spontaneous piano interlude. I’m surprised I haven’t seen more hackerspaces with a piano; they’re effectively free if you have a truck and a place to store it. While the World Create Day event at the BlenderLab hackerspace in Lille, France didn’t set out to change the world with a project, they did manage to come up with a really neat digital hourglass. The body of this hourglass is made out of laser cut plywood, with the display made out of two LED matrices oriented at a 45-degree angle. While World Create Day is a challenge for hackerspaces around the globe to come together and create something that solves a problem, that doesn’t mean there aren’t slightly more official events around the globe. Hackaday set up our own events in New York City, LA, and San Francisco. The New York event was great thanks to our lovely East coast community manager [Shayna] and our hosts at Fat Cat Fab Lab. 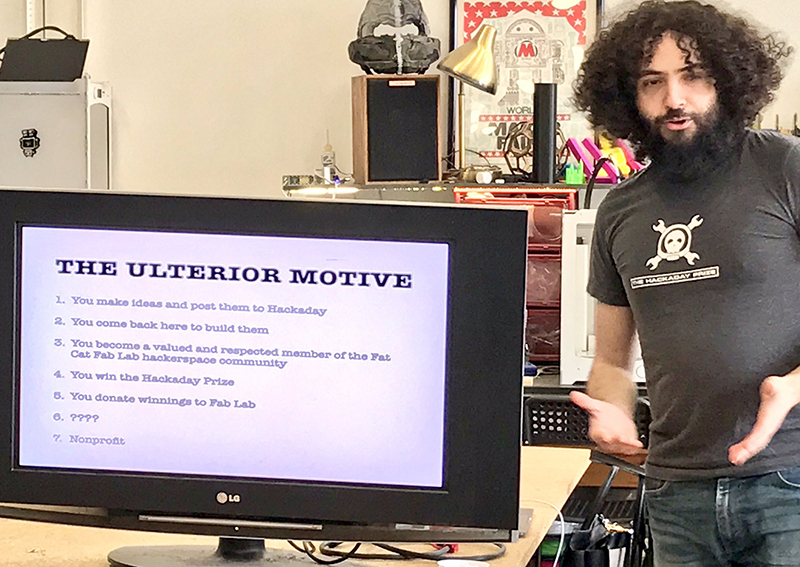 [Zach Freedman], one of the regulars at our NYC meetups has an ulterior motive for getting the Fat Cat Fab Lab members to contribute their ideas to the Hackaday Prize: winning the Hackaday Prize would result in donating the winnings to the Fab Lab. It’s a brilliant and devious plot we very much recommend. There were many more events going on around the globe last weekend, and we want to hear about how your World Create Day went. We’ll be covering more of the events of last weekend in the coming days, so make sure to add your pictures, stories, and links to the projects you started on your World Create Day event page on Hackaday.io. Event organizers are going to get some super awesome swag for making that effort. ” great for science and technology. While thousands of people took to the streets” Yeah. cause everyone knows that scientific progress is made through angry mobs bullying any skeptics into submission. A nice day to show to the public that Hackers doesn’t mean Piracy. It is still deep written in french people mind… Hope to be of yours next year. Thanks HaD Team for your support.